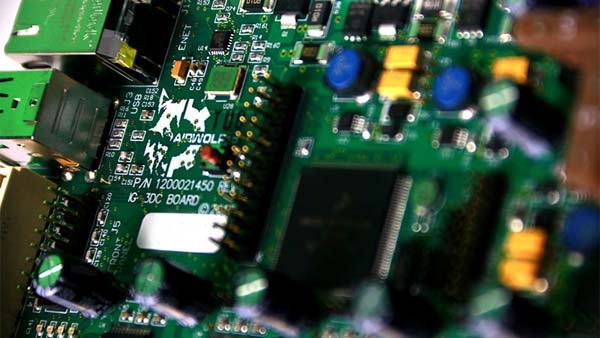 Airwolf 3D's EVO is powered by its Genesis board, a redesigned, automotive-grade microcontroller engineered for 3D manufacturing. The proprietary 32-bit redundant, embedded controller is said to provide more precision and greater control, at double the speed of the commonly used RAMBo board. Photo courtesy of Airwolf 3D/PR Web. FOUNTAIN VALLEY, Calif.–Airwolf 3D recently released EVO, its 5th generation 3D printer that is said to be so advanced that Airwolf calls it a desktop "Additive Manufacturing Center," or AMC. "The EVO is completely new and it's unlike anything out there," said Airwolf 3D Co-Founder and CEO Erick Wolf, in a company release. "We took the technology that we perfected with our prosumer line of 3D printers and leveraged it to develop a machine that's light years beyond anything else on the market. The EVO is faster, stronger, and more accurate than any desktop 3D printer–it delivers a premium 3D manufacturing experience at less than half the cost of machines that offer equivalent performance. Plus, it's packed with new technology that dramatically changes the way we manufacture, including the ability to work in metals. The EVO far surpasses the capabilities of a traditional desktop 3D printer. It's a true desktop Additive Manufacturing Center." 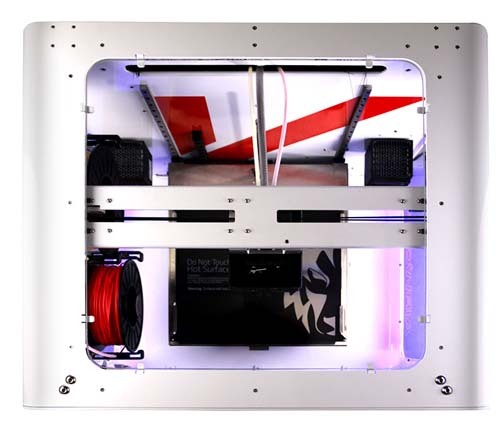 The EVO possesses Airwolf 3D's signature suite of features–auto-leveling, large build size, high-temperature multi-material printing, and compatibility with water-soluble Hydrofill support material–but in an ultra-ruggedized unit that includes cutting-edge features available only from Airwolf 3D. The EVO includes heavy-duty, CNC-style linear precision guides that are described as "maintenance free." Photo courtesy of Airwolf 3D/PR Web. Most notable among these is the industry-first PartSaveTM. Nicknamed "Zombie Mode," PartSave solves one of the most frustrating problems with 3D printing. There are few things more disheartening than 3D printing a part for hours, only to have it fail completely if the printer stops because of a power outage or unplugging the machine. With PartSave, once power is restored, the machine resumes where it left off, enabling the part to finish. Another industry-first feature, the company said, is FailSafeTM. If you run out of filament or experience a jam, FailSafeTM has you covered. Just place the print head at the height you left off and FailSafe will do the rest, restoring your print and completing the job with time to spare, according to Airwolf. The EVO also ships with a full-color 7-inch Matrix touchscreen display, new Tri-HeatTM Enclosed Build Environment, an oversized air purifying system for active containment of UFP and VOC emissions, and dimmable, ultra-bright focused LEDs for observing part manufacturing. The EVO's features are powered by what Airwolf calls a dramatically redesigned microcontroller. Reported to be the only one of its kind in the industry, the Genesis Board is a proprietary, automotive-grade 32-bit redundant, embedded controller engineered for 3D manufacturing with more precision, greater control, and at double the speed of the commonly used RAMBo board. Airwolf said that combined with a high-flow dual hot end, a high-torque cartridge-style planetary extrusion system, maintenance-free CNC-style linear precision guides, and an oversized stepper motor with an integrated stepper lead screw, the Genesis Microcontroller makes the EVO the "fastest, highest performing desktop additive manufacturing system in its class." With a 100 percent aluminum unitized frame and one-piece steel build platform, the EVO is constructed in a rigid monocoque to maximize structural integrity and minimize bulk and weight. A "nearly unbreakable" three-bolt-reinforced extrusion system and oversized 1000-watt power supply are said to further support mission-critical applications, even in the harshest environments. As a result, Airwolf said, the EVO is "an ideal prototyping and manufacturing tool for aerospace, automotive, medical, and other professionals." Airwolf 3D (https://airwolf3d.com/) is committed to designing, manufacturing and selling 3D printers, 3D printer filament, 3D printing software, and 3D printing peripherals that are fast, affordable, durable, and easy to use. All Airwolf 3D printers are manufactured in the company's 12,000-square-foot facility in Fountain Valley, California.